Ferrall & Co. Lawyers practice in all areas of personal injuries litigation. We’re here to help you get your life back on track after sustaining an injury – whether you have been injured in a car accident, workplace accident or in a public place we are here to help you receive all that you are entitled to. Ferrall & Co. Lawyers invite you to contact us to make an appointment so that we can go through the claim process and advise you on what you are entitled to. You may be entitled to receive payments from more than one insurance policy and it is very important for you to obtain advice as soon as you can after being injured as strict time limits often apply to personal injuries claims. By choosing to retain Ferrall & Co. Lawyers you will be in getting the guidance and expertise of over 14 years of practical experience. If you have been involved in a car accident and have been injured you may be entitled to bring a Compulsory Third Party(CTP) insurance claim. You are able to do this if the accident happened due to someone else’s negligence or fault. This is the case if you were injured in a car, riding your pushbike, using public transport or were a pedestrian. CTP insurance is available to anyone who has been injured because of someone else’s actions involving a motor vehicle being used on a road. It is always best to obtain independent legal advice on the potential claims you may be able to bring because of your injuries. Ferrall & Co. Lawyers are able to assist you and guide you in the right direction regarding potential claims you may be entitled to. There is also the prospect of a claim being made for the dependents of a victim of a car accident if the victim died because of their injuries. These claims cover such things as funeral expenses and the loss of financial dependency for the family. There may still be a CTP claim to make even if the vehicle that caused your crash cannot be identified or was unregistered at the time of the collision. For these claims the CTP insurer is the Nominal Defendant and it is very important for you to obtain independent legal advice as soon as practicably possible because the time frames to bring a CTP claim are much shorter. You should always obtain legal advice as soon as you can after being involved in a car accident, as this will ensure that you know all of your legal rights. At Ferrall & Co. Lawyers we are able to advise you of the critical dates that apply to your particular claim as well as what claims are open to you. If you are involved in a motor vehicle accident in Queensland there are potentially a number of claims open to you depending on the insurance that you hold. We will be able to guide you through the CTP claims process as well as any other insurance available to you. We look forward to assisting you with your claim. It is important for you to always obtain the name, contact details and registration of the other vehicles/people involved in the collision. You should also take photographs of the injuries sustained in the collision as well as the damage done to any vehicles involved. The workers’ compensation scheme in Queensland is governed by WorkCover Queensland. The WorkCover scheme covers workers if they have been injured whilst at work or travelling to or from work. If you have been injured at work or travelling to or from work then you should speak to us in order to determine what your rights are. Due to the WorkCover scheme being mandatory in Queensland it is likely that you will be covered. The WorkCover scheme in Queensland is designed to protect and support workers who have been injured at work, by giving them access to compensation for lost wages, medical expenses, rehabilitation and other expenses. If the injuries were caused by the negligence or fault of another party, whether it was your employer, a site supervisor or another driver, you are also likely to be entitled to make a damages claim, and should obtain independent legal advice as soon as possible so that you know your rights. Even if you consider yourself to be self-employed or are referred to as a sub-contractor you may be covered by WorkCover and should always check. Ferrall & Co. Lawyers will be able to advise you whether you are entitled to workers’ compensation as well as any other insurance payment for the injuries. If at any time during the WorkCover claim process you are offered a lump sum amount you should immediately obtain independent legal advice prior to accepting or signing anything. Strict time limits also apply to certain documents under the WorkCover legislation and it is always best to obtain legal advice if you are uncertain of anything during the process. Ferrall & Co. Lawyers will be able to assist you through the WorkCover process and provide you with ongoing support and advice throughout. Strict time limits apply throughout the Workers’ Compensation process so it is important for you to obtain independent legal advice as soon as you are able. 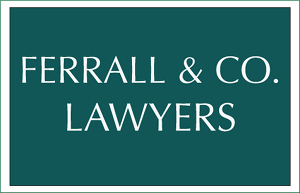 Ferrall & Co. Lawyers are able to provide you with expert guidance throughout the process and invite you to call us for an obligation free consultation. If you have been injured at a place other than at work or in a motor vehicle accident then you may be able to make a public liability claim. This could happen at either a public or private place even though the claims are referred to as public liability. Injuries that fall within the scope of public liability claims can happen at many different places and it is always best to seek independent legal advice to see whether you have a claim to make. Ferrall & Co. Lawyers will be able to guide you through the process of bringing a public liability claim. It is very important to be aware that in order for you to be successful in bringing a public place personal injuries claim you must be able to demonstrate that the negligence of a third party caused your injuries. If you have been injured and can show that someone else caused the injury you are likely to be able to bring a public liability claim against them. It is always important to seek independent legal advice if you think you may be eligible to make one of these claims. Ferrall & Co. Lawyers are able to advise you of your options in relation to all Public Liability Claims. Please be aware that strict time frames often apply to these types of claims it is therefore important to call us as soon as you can to ensure you receive the advice you need. Airline carrier claims are claims you are able to make for personal injuries sustained during certain types of air travel. If you have purchased a ticket for your air travel then you may be able to make a claim against the airline or carrier responsible for the flight if you sustain an injury during the flight. Airline carrier claims can arise during many different flights so it is always best to seek independent legal advice to see whether you have a claim to make. An airline carrier claim is a no fault system, although there are certain criteria a claimant must meet to be entitled to bring a personal injuries claim against the airline. Because of this it is very important to speak to someone about the possibility of making a claim. You may be entitled to bring an airline carrier liability claim against the carrier who was in control of the flight if you have been injured during an air trip for which you bought a ticket for. It is always important to seek independent legal advice if you think you may be eligible to make one of these claims. Ferrall & Co. Lawyers are able to assist you with all Airline Carrier Liability Claims. We are also able to advise you of your options in relation to bringing a claim. As strict time frames often apply to these types of claims it is important to call us as soon as you can to ensure you receive the advice you need. Death dependency claims are also referred to as wrongful death claims. These claims arise if someone you are financially dependent upon dies due to the negligence of another person. If this is the case then you may be entitled to bring a death dependency claim against that person or their insurer. You are usually entitled to bring a death dependency claim if your partner, spouse, parent or someone you are financially dependent upon dies due to another person’s negligence. Death Dependency / Wrongful Death Claims are governed by different laws and depend on how and where the person’s death occurred. In order for you to be successful in a death dependency or wrongful death claim you must show that a third party caused the death by their actions or omissions and that you were financially dependent upon the deceased at the time of their death. Ferrall & Co. Lawyers are able to advise you whether you have a viable claim for the wrongful death of a loved one, as strict time limits often apply to these types of claims it is important to call us as soon as you can to ensure you receive the necessary legal advice. If you are no longer able to work due to accident, injury or illness you may be entitled to claim for Total and Permanent Disablement (TPD) benefits. TPD benefits are policies of insurance that people have, either through their superannuation fund or through a private policy. Quite often current superannuation policies have insurance policies attached to them for such things as Total and Permanent Disablement (TPD), Partial and Permanent Disablement and Income Protection. You may not realise that you have additional insurance attached to your superannuation and if you are no longer able to work it is important to check as you may be able to make a claim against your policy which is separate to any other claim. Unlike many personal injuries claims you do not have to be injured as a result of anyone else’s negligence to bring a claim for Total and Permanent Disablement (TPD), Partial and Permanent Disablement or Income Protection claim. You simply have to meet the relevant criteria set out in your policy documented. Because each insurer has different clauses in their policy documents it is very important to obtain independent advice on whether you are eligible to make a claim. Ferrall & Co. Lawyers are able to assist you with making an application for TPD benefits. Strict time limits often apply so it is very important to obtain independent legal advice as soon as you are able to. You are able to bring a mental or nervous shock claim if you have suffered a psychological or psychiatric injury because you witnessed or learned of a shocking incident or event. Quite often injuries arise when people learn of the wrongful death of a loved one. Some people also succumb to a mental or nervous shock injury after witnessing horrifying events and each case is determined on its own circumstances. The person bringing the claim also has to be suffering from a recognised, diagnosed psychological injury that can be attributed to witnessing the shocking event or learning of it. Mental or nervous shock claims arise out of many different circumstances and are governed by different laws depending on how the injury arose. It is always best to seek independent legal advice to see whether you are entitled to bring a claim for mental or nervous shock. Ferrall & Co. Lawyers are able to assist you with any mental or nervous shock claim you may be entitled to bring. We can also advise you of your options in relation to bringing a claim. Strict time frames often apply to these types of claims so it is important to call us as soon as you can to ensure you receive the necessary advice. Ferrall & Co. Lawyers generally offer no win no fee agreements for most Personal Injuries Claims. Based in Caloundra on the Sunshine Coast, we at Ferrall & Co. Lawyers pride ourselves on helping the community with all legal matters, big or small.